Two important reports have been published this week, in different areas of Alzheimer’s research, and you need to know about them. A link between dementia risk and pollution becomes more likely with each report published on the subject. This week a team from Kings College, London, revealed research showing a positive association between residential levels of air pollution across the city and dementia diagnosis. Over-50s in areas with the highest levels of nitrogen oxide in the air showed a 40% increased risk of dementia, compared with those living in areas with the least pollution. As Annabel and I both live by an arterial road, and under the flight path into Heathrow, we find this extremely depressing! The authors of the report estimate, in mathematical terms, this increased risk equates to 60,000 of the UK’s 850,000 dementia cases resulting from pollution. But this research can’t reveal how pollution impacts dementia risk, it can only show a link. More research is needed to examine what pollution is doing to our brains. Similar research has already linked air quality to cardiovascular and respiratory disease. And yet we continue to live under polluted skies. Clearly, not enough is being done to tackle this issue. If, like us, you’re passionate about tackling air pollution, find out what you can do here www.healthyair.org.uk. And take heart from research showing that following a Mediterranean-style diet may blunt the impact of some forms of air pollution on our health. There’s more on Annabel’s blog post here. In recent decades, research and drugs trials relating to Alzheimer’s have focussed on the build-up in the brain of a protein called amyloid beta. But, so far, no medication to reduce levels of this protein has succeeded in clinical trials. Research published this week, again by King’s College, indicates why it’s so hard to reduce levels of amyloid beta. Scientists believe that an amyloid build up causes another protein, DKK, to go haywire. DKK’s job in the brain is to maintain healthy synapses and prune away old ones. When faced with too much amyloid, DKK starts trimming the healthy synapses instead, like a deranged gardener running amok with the pruning shears. This causes more amyloid beta to be released and creates a vicious cycle. It’s very early research using cells and mice in a lab. But could a drug control DKK? That’s the next stage. Over the summer I dropped into a live webinar by Dean and Ayesha Sherzai, authors of The Alzheimer’s Solution. They were full of helpful advice on reducting dementia risk and I’ll share more details in a future post. The Sherzais are passionate advocates of a plant-based diet, saying, ‘It’s the plant component of any diet that seems to be the bit that works – it comes back to plants over and over.’ They believe that a plant-based diet halves the risk of Alzheimer’s compared to an omnivorous diet. With that in mind, this week’s recipe is completely vegan. These burritos are hearty and filling, but not heavy. There are a few more stages, and ingredients, than many of our recipes but if you can roast the sweet potatoes ahead of time, they’ll come together quickly. Pre-heat the oven to 180C. Put the cashews in a small bowl and cover with warm water. Soak for at least an hour. Prick the sweet potatoes all over and roast in the oven for 45-50 minutes, until completely soft. Leave to cool. Heat 1 tbs of olive oil in a large frying pan. Saute the onion until soft and translucent – about 5 minutes – then add the garlic. Cook for 30 seconds, then add the spices and a good pinch of salt. Cook for a minute more, until you can smell the spices, then tip the contents of the pan into a food processor. Put the pan back on the hob and add the other tablespoon of oil. Add the spinach and cook until it just wilts. Season well with salt and pepper. Leave to one side. Scoop the flesh out of the sweet potatoes and add to the food processor, along with the lemon juice. Drain the cashews and add them too. Blitz everything so you end up with a smooth, creamy puree. Taste and season as necessary. Lay out a wrap and spread one-sixth of the sweet potato mix along the centre. Add a portion of spinach and a tablespoon of black beans. Turn in the base of the wrap, then roll up to form a burrito. 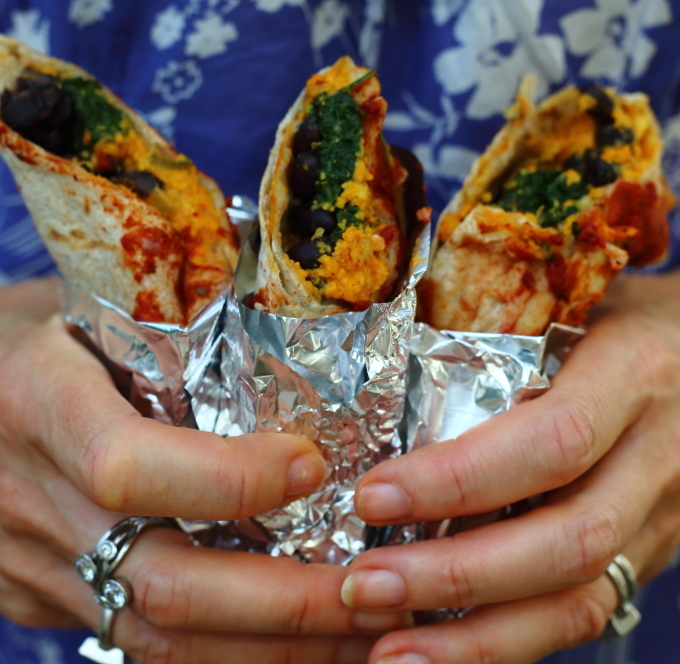 Repeat with the other wraps and serve immediately with tomato salsa for dipping. Thanks so much Julie! So glad you like the blog. Do look out for our book next year!